TAMI is an easy to use yet powerful sample identification software - TAMI monitors the mass spectra you are analyzing with your native data analysis software and can automatically obtain the data and present its own analysis results. TAMI generates elemental formulae for sample compounds using several independent parameters such as the measured masses, the molecular ions isotopomeric distributions and optional restrictions provided by the user. This unique analysis upgrades sample identification capabilities of unit resolution quadrupole based GC-MS and LC-MS systems to be equivalent or superior to those of high resolution accurate mass time of flight MS.
TAMI further includes a post-run mass calibration tool that by itself can improve the quadrupole based measured mass accuracies to below 100 ppm. This feature further increases the elemental formula identification probabilities that are calculated by TAMI based on the measured isotope distribution patterns, providing a total equivalent accuracy of under 1 ppm. With GC-MS, TAMI also automatically links with the NIST MS Library to confirm or reject its identification results, significantly enhancing the confidence level in the NIST library identification. TAMI is automatically launched when a spectrum is analyzed and can be configured to analyze the data automatically (no action is needed from the user). With only a few additional clicks one can apply additional analysis tools. After every analysis, TAMI provides additional information such as elemental statistics and recommendations. 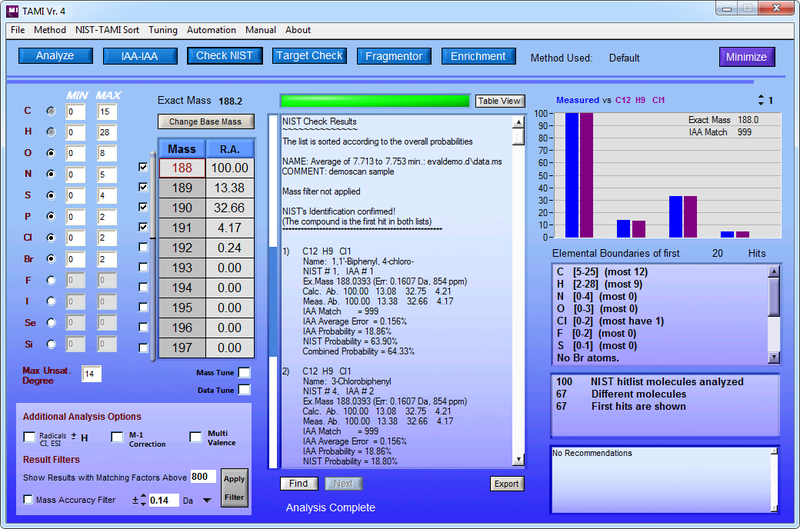 TAMI also includes additional analysis tools, allowing the identification of fragment (product) ions, and the determination of isotopic enrichment. TAMI is highly useful in combination with standard single quadrupole based GC-MS such as the Thermo ISQ or the Agilent 5975/7, providing major improvement and the highest confidence level in your sample identification. TAMI can also provide unprecedented benefits to LC-MS users and was recently streamlined for working with Advion’s CMS and seamlessly provide vital elemental formulae information for mass spectra obtained with the Data Express software. Provides elemental formulae for unknown compounds with your quadrupole GC-MS or LC-MS data, the same as with expensive high resolution accurate mass instruments. In addition to working with profile (raw) data files, TAMI can also operate with standard centroid data files which generate x10 smaller files. Consequently, TAMI can also be used to analyze old data files that you have already acquired. TAMI is very easy to use, zero clicks for default analysis and only one or a few clicks for an optional follow-up analysis. The combination of TAMI with NIST library significantly improves the identification confidence level by confirming or rejecting the library identification results using independent Isotope Abundance information. TAMI-NIST identification probability is much higher than that of accurate mass alternatives for compounds that are in the library database. TAMI is far less expensive than any available alternative. Contact us at: aviv@avivanalytical.com to get a price quotation for TAMI, or additional information (flyer, tutorial and/or manual). We shall be happy to help you explore the utilization and applicability of the TAMI software for the analysis of your sample compounds. You can analyze them with the free TAMI download (using the link at the top of this page). You can also email us your mass chromatogram file for our advice on the best use of TAMI with it and for our provision of elemental formula from your data file. 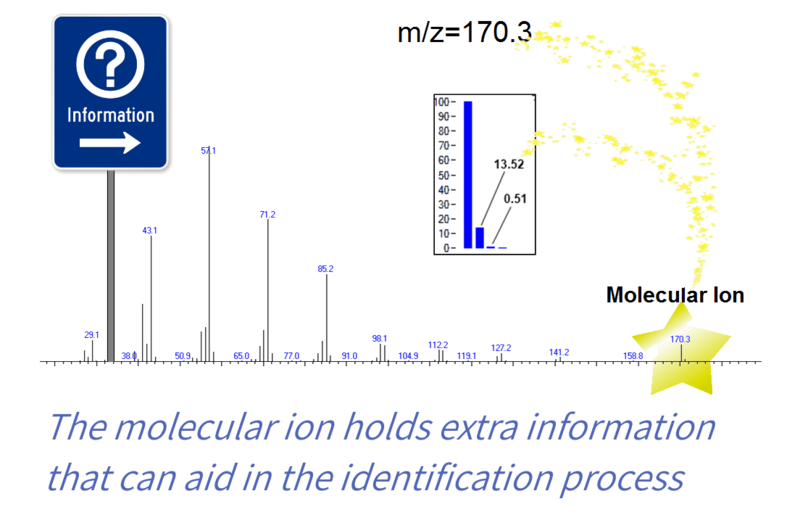 Finally, if any of your compounds do not exhibit a molecular ion you can contact us for our service analysis with our GC-MS with Cold EI which practically always provide molecular ions and can serve to analyze much bigger and more labile compounds and provide elemental formula with TAMI. We trust that you will find the TAMI software powerful, reliable and easy to use tool for significantly improving your sample identification capabilities.